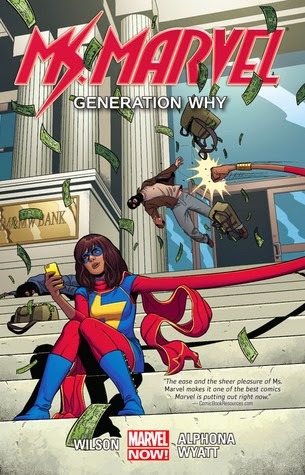 As it turns out, a new superhero stretching her legs in Jersey City attracts a bit of attention from other heroes, as Kamala realizes in Ms. Marvel Volume 2: Generation Why. Note: Ms. Marvel Volume 2: Generation Why is the second volume in a series. For the review of Volume 1: No Normal, click here. Otherwise, read on! Kamala Khan's finally starting to get a hang of this whole 'superheroing' thing. She's got a helpful friend, she's getting her family squared away, and even the leader of her mosque seems ready to trust her to make the right decisions. She's even attracting the attention of some of the higher-ups in the superheroing world. When Wolverine ends up in Jersey City tracking down a runaway from Jean Grey's school, it only makes sense that they'd end up in the same place at the same time. With a requisite amount of fangirling on Kamala's part. It looks like Kamala might need a bit of helo figuring out the finer points of her powers, as well as how to balance the different aspects of her life. And since her powers came about after being exposed to the Terragen Mist, Wolverine has a pretty good idea who might be available to guide her. And she's going to need some serious guidance coming up here. The Inventor is hardly backing down, and more and more teens are disappearing. He's convinced the kids that the adults are right, and that they are a waste of a generation. They've completely bought into the idea that the only thing they're good for is as a renewable resource for The Inventor's plans. Can Kamala show them that perhaps the adults aren't always right, and that they have important contributions to make themselves? G. Willow Wilson captures the attitude of the generation perfectly. Having been told for years that they are entitled, good-for-nothing slackers, it's only reasonable that they'd finally internalize this contempt. Wilson combines the problems and doubts of the younger generation with a villain who knows exactly how to exploit them for a wonderful story arc. This is a can't miss volume of a series that keeps expanding into the rest of the Marvel universe. Verdict: Completing the arc begun in No Normal, Generation Why shows off Wilson's writing chops, Alphona and Wyatt's artistic skills, and firmly cements Khan's place in the Marvel universe.